This is a basic activity to work on visual discrimination of color and size using colored puffs. I purchased a large bag of colored puffs, in different sizes, from Michael’s a few years ago and am still finding ways to use them in My Obstacle Courses to build different skills. Since it is February (almost Valentine’s Day! 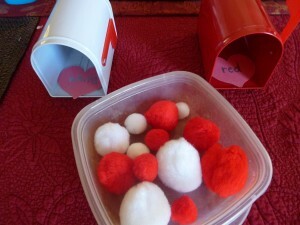 ), I chose the white and red ones to use in these station activities to go with our theme. I placed a handful of puffs, between 10-15, in a container to keep them organized (they could also be placed in a zippered bag to work on opening and removing items while holding the bag – for some children that is a challenge). 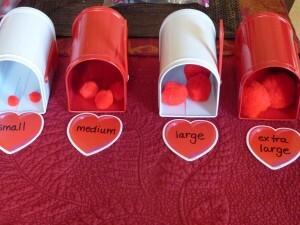 I used heart-shaped calendar cutouts labeled according to how the puffs were to be sorted – in this particular activity they are labeled “white” and “red.” I also provided a place for him to put the puffs (see below for more on thematic sorting containers). It’s all set and ready for sorting! I strategically picked puffs in each size and placed them into the container. 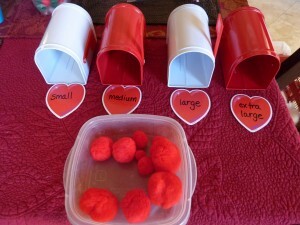 I labeled the mailbox sorters so he would know which size puffs to place inside. You could also provide a sample puff for each size so that your child can compare and check their choice. It’s all set and ready for sorting! Helping to build basic skills like this does not have to be complicated! Activities like this are quick and easy to set up but allow you to see firsthand how your child does with these concepts. Too easy? Now you know they can do it and the next time you can use an activity that will challenge them. Too hard? Scale it back and include more activities like it to build their skills. I have attached a developmental skills timeline/survey I received a few years ago (it is also on my website). I really like this timeline and use it to determine what we need to work on with Andrew and what we need to do next once he has mastered a skill. This timeline is unique because it lists out skills in order according to developmental areas, and does not list them by what a child “should” be able to do according to chronological age. I’m always on the lookout for fun, thematic items to include in My Obstacle Courses and found these cute red and white mailboxes at Target last year. The dollar section in the front of the store usually has fun containers or buckets that go with the season we are in or about to be in. I get them to use for thematic looking sorting stations. This year I went and while my particular store did not have the mailboxes, they did have boxes that resembled Chinese food take out boxes. You could make your own “mailboxes” from shoe boxes or use plastic containers. In working with Andrew, I find that it helps to have a specific place to put things that we are sorting. If you’d like ideas specific to what your child needs to work on, please email me at obstaclecoursemom@yahoo.com or leave me a post on My Obstacle Course’s Facebook page. I love hearing from you!